With a new year comes a whole bunch of new trends to experiment with. Mixing up my beauty routine is my personal favorite way to change my look. It doesn't require shelling out a bunch of cash for a new wardrobe or making any long-term commitments. The best part is, most of the time you already have the materials on hand you need to experiment with makeup. That means no need to spend money on products you may only use a couple of times. Talk about guilt-free! There are plenty of 2016 beauty trends that everyone should try at least once before next January rolls around, and I'm about to talk you through them. Say goodbye to those '90s brown lips and the bronzed eye of 2015. The year 2016 is all about shaking up your beauty routine. In lieu of a neutral eye, try something in blue or pink. It may sound intimidating now, but you're going to thank me for it when you start getting compliments on your new look. For your hair, try going a but more natural than you did last year. This year is all about the air-dried look and embracing your natural hair texture. So, put down the hair dryer and flat iron and slowly back away. Your hair will thank you for it later. 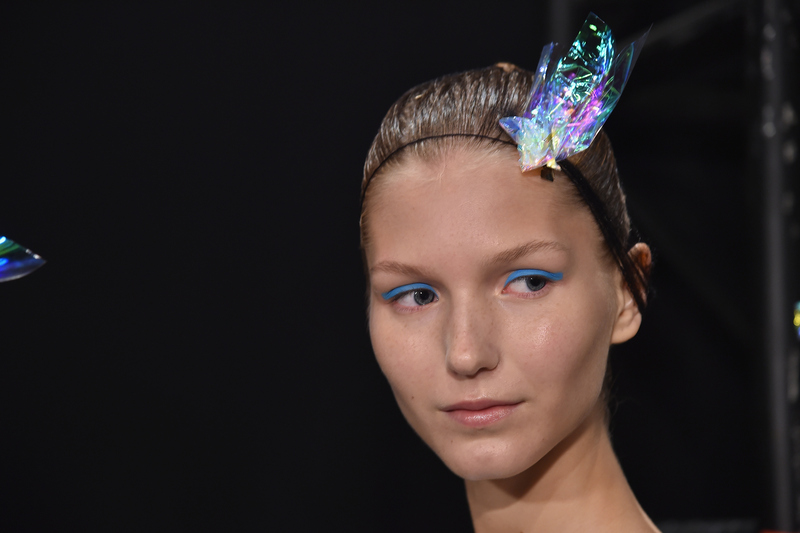 If you end up trying all of these 2016 beauty trends and hating them all, no worries! There are few things worse than getting into a beauty rut. New products are released every season, and if you only use the same five things over and over, you'll never step out of your comfort zone! Take a look below at some of the best beauty trends you need to try this year. Matte skin was so not in at Opening Ceremony S/S '16, where models sported dewy skin that looked fresh and natural. For some light coverage and serious glow, try using a cushion compact. Korean brands have already mastered this product, but this L'Oreal version can be found at your local drugstore. Makeup artists brought out the big glitter at the Creatures of the Wind show. You can make glitter work for day by putting a tiny bit on the center of the eyelid to really make your eyes pop or drawing a thin line of glitter liner near the lashes for a hint of sparkle. You can make a sparkly look work for day or night depending on how much of this glitter liner you use. Draw a super thin line for a hint of glitter, or a thick cat eye if you want a bit more drama. A simple variation on the braid hit the Public School runway. Whether you want to get your hair out of your face, or are looking for an alternative to the classic braid, give this twisted look a try. Use these clear elastics to tie up the end of your twist instead of a classic black or brown hair tie for a super clean, sleek look. The elastics are thin and won't steal the spotlight from your fresh new hairstyle. Blue shadow was all over the runways this season, but one of the best interpretations was at the Diane Von Furstenburg show. A smoked-out look in aquamarine blue can seem a little crazy, but blue shadow or liner is perfect for the warmer months and can really make your eye color pop. Use a fluffy brush and a light hand to give a sheer wash of color all over the lids for a more subtle look, or try wetting an angled brush to use the shadow as a bold liner. The models at the DKNY show sported some seriously envious brows. You can get a similar vibe by brushing your brows upward to give them a "boy brow" look. This is much more natural than the Instagram brow that was so popular last year. The perfect product to get a natural looking brow! The formula thickens brows while also grooming hairs into place. The beloved french manicure is back this year, this time with an update. The models at Monique Lhuillier wore a classic french manicure with a twist. Rather than the traditional white tips, colored french tips were all the rage. Much more fun than the original, no? Draw a super thin line of this Essie polish on the ends of your nails just like you would for a classic french manicure. The bright green color is the perfect pop for spring. Cherry red lips were spotted at multiple shows this season, but my personal favorite was at the Jason Wu show. Whether you're more into a matte or glossy finish doesn't matter as long as you find a lipstick in the classic cherry red shade. If you're looking for the perfect cherry lipstick in a matte finish, this is the lip product for you. The staying power and gorgeous color are well worth it. Adding a little bling to your hair is very much in right now. Models at the Marc Jacobs show sported messy up-do's pinned down by some luxurious silver hair pins. Try swapping some statement hair accessories for your usual bobby pins to pin back your bangs or spice up a boring bun. A beautifully intricate hair clip to add some character to a basic low bun. This piece can be used a multitude of ways, so get creative! Models at the Jill Stuart show ditched the neutrals and went for a rosy eye look. If you want to try out a softer and more romantic makeup look, this is definitely the trend for you. This eyeshadow palette features three pink shades perfect for giving this beauty trend a try. If you're a little intimidated by going full-on pink, try smoking out the look with the other neutrals in the palette for just a hint of rosy color.